IrishTrucker - Business booming at E.D.S. Established in 1997, Express Distribution Services Ltd has grown into one of Ireland’s leading distribution companies with a fleet of 50 strong. Irish Trucker learned more about the Armagh-based business from its founder David Neill. These past two decades have saw quite the rise for Express Distribution Services Ltd and the company’s founder and owner David Neill is very much intent on continued growth for his thriving business. 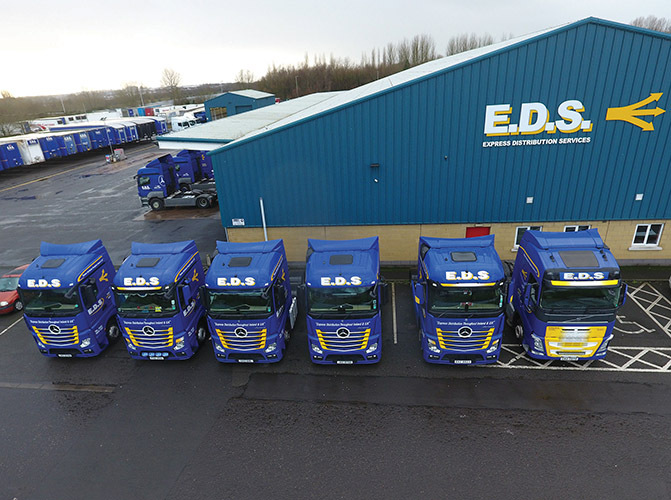 Operating with 75 staff, the company now widely known as ‘E.D.S.’ specialises in a 24-hour palletised delivery throughout all of Ireland along with a 48/72 hour service to the United Kingdom and also offer scheduled exports to all parts of Europe on a daily basis. As well as specialising in groupage and distribution for a wide range of clients, the company also provides an efficient service with full tracking of documents and deliveries for its customers. E.D.S. is located in Silverwood Business Park along the Silverwood Road in Craigavon, Co Armagh and its state-of-the-art truck fleet includes a blend of Mercedes, Iveco, Scania and Volvo. These days those trucks are very much flat-out on the roads as business has been booming for the company which marked its 20th anniversary last year. David was good enough to take time from an increasingly hectic schedule to fill Irish Trucker in on what his business is about and what they’ve been up to lately in the Orchard County. “We’re very, very busy,” explained David. “There’s plenty of business out there and right now we have 50 vehicles, ranging from 18-tonne rigids to 44-tonne arctics. A new Mercedes was recently purchased with custom number plates applied to help mark the 20-year celebrations for E.D.S. The plates feature the names of David’s eldest two grand kids. Indeed it was a nice touch and that’s something which the company have become known for amongst clients down through the years. Having started up in 1997, David grew his venture from the ground right up and now E.D.S. is operating from a warehouse which is a 20,000 sq ft building with 19 loading doors, developed on a 3.5 acre site. All of the company’s maintenance work on its vehicles is carried out onsite in a state of the art workshop by fully qualified mechanics. Every single one of those vehicles is equipped with tracker devices and mobile phones. It’s a far cry from when David first started out, especially when you consider that E.D.S. has since acquired Trailerfreight International and now have a depot in Wolverhampton in the UK. No doubt things are very different than they were when it all started off 21 years ago for this successful business and the founder was able to fill us in on its origins. “The time I left school I went to work with a transport company and I eventually left it when I was 35,” David outlined. “I went out then and just started up on my own. That was 1997 and we basically just grew year on year and kept increasing our staff, which have been very dedicated down through the years, and our fleet to the point where it is now. The purchase has since enabled E.D.S. to provide a reliable cost efficient next day service to and from the West Midlands. The company already offers its clientele a next day delivery service throughout the whole of Ireland for palletized freight and also offer a 24/48 hour delivery service for pallets to and from Northern Ireland and Mainland UK. Of course, there’s also an express next-day delivery service to the Midlands area of the UK Mainland and a three to five day delivery service throughout Europe. E.D.S. have daily trailers leaving its depots in Birmingham and Craigavon shipping to each depot and are currently shipping ten trailers each evening across the Irish Sea. They have standard bookings for trailers travelling across the Irish Sea with all of the major shipping companies. As David himself puts it, E.D.S. are “dealing with reputable partners” and that can only come off the back of providing an excellent service time and time again in this business. 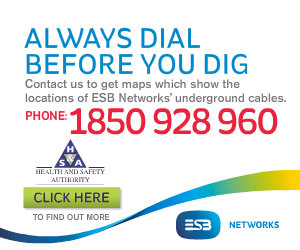 Two years ago, the company signed a £250,000 telecoms contract with Rainbow Communications. The deal with the independent telecoms provider included a range of different services, including online tracking of all of the company’s vehicles as well as monitoring driver behaviour. Having previously encountered problems with different providers, the new transport software system continues to improve the level of service in which E.D.S. provides to its loyal customers. So what has kept those customers so loyal over the past 21 years? “Our staff here are very dedicated and my son Jonathan, who is Operations Director, so he kind of runs the show for us. I can’t credit the people we have working for us here enough,” David concluded.